Mechanisms for ad display and pricing work differently on search sites and in the ad networks. 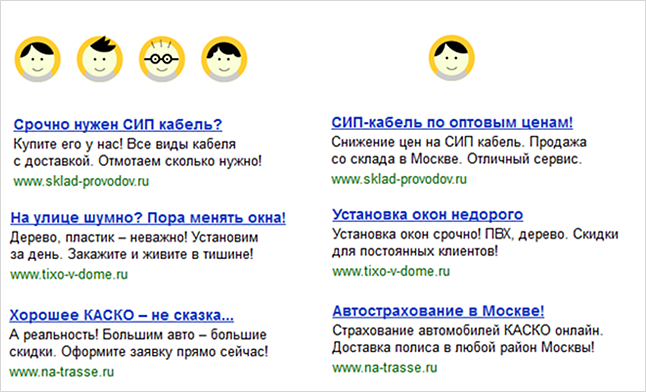 Therefore, it makes sense to separate search- and ad network-oriented ads in Yandex.Direct. This technique will allow you to manage your ad budget effectively and also noticeably increase your return on ad placement. 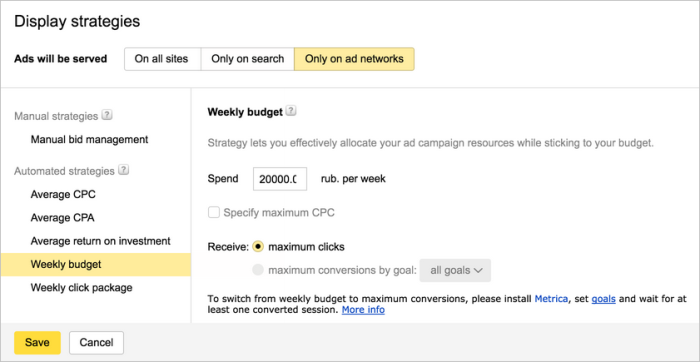 Create a new campaign and only enable impressions in ad networks in the strategy settings. Then you can select the best strategy. It is difficult and inefficient to manually control the placement of ads in the ad networks. Therefore, you should activate one of Direct's automatic strategies. The strategies work according to powerful analytical algorithms that focus on the nuances of various forms of targeting and take into account the features of specific sites. Meanwhile, you can focus on working with your ad texts and keywords. For example, you can choose the Average CPC strategy. This strategy ensures the maximum number of clicks for the average amount you are prepared to pay per visitor. A similar principle is used for the Average CPA strategy, which is focused not only on user conversions, but also on the relevant targeted activities on the website. The settings for the Weekly budget strategy will help distribute the costs of the advertising campaign efficiently within the set budget. You can set the required number of clicks per week as a reference for the Weekly click package strategy and the system will aim to get them at a minimum cost. To manage placements manually, enable the manual bid management strategy. In this case you will be able to control the bids yourself and quickly respond to changes in the system. For advice on how to select a suitable strategy, read the special Help page. After setting up a separate campaign for impressions in ad networks, you should select impressions only in search in the strategy settings of the original campaign. For impressions in the ad networks, the system defines itself where, when, and to whom your ad can be interesting. Therefore, you should not limit the system with too specific or exact keywords. It is better to select word combinations consisting of two or three words. For example, to advertise tourism services, it is advisable to use the following keywords rather thanRed Sea family leisure , cheap honeymoon tourist packages to El Gouna , buy a last minute tour to Sharm el-Sheikh: Red Sea leisure , honeymoon trips, last minute tours to Egypt. The keyword selection operators for ad networks not only refine the keywords, but can also exclude the target sites. Therefore, use operators carefully to avoid losing good positions for ad impressions. For example, if you use the keyword “custom-built furniture” in quotes, the ad will not reach sites which do not have this particular wording, but which have other suitable ones such as cheap custom-built furniture or advantages of custom-built furniture. If you use the keyword radiator grill+for a car, the ad will not reach sites with the following word-combinations: grill for car radiator, or radiator grills for cars. You also need to be careful when using negative keywords for ads in the ad networks. Only use them if you are absolutely sure that your target audience does not visit sites with these words. For example, before buying a car, people are often interested in the opinions of other owners of this car and search for sites with the appropriate content. If you want them to see your ads, do not put the minus sign before words such as forum, review, or feedback. To attract a user who is busy looking at a site, ads in the ad networks should be made more noticeable. Try to present the advantages of your offer as clearly as possible. Avoid using a basic outline of facts or clichés. Write emotional and interesting texts, but do not overdo it — your ad must be intelligible. Add an image to the ad. A relevant image will make your ad stand out more and also make it clearer. Convenient access to your contact information will help customers contact you faster. These help shorten the user's path to the required pages on your site. Some words in ads can significantly influence ad effectiveness. These additions are known as selling text. Similar types of selling text are used both for search sites and ad networks. However, the same words that can raise CTR considerably on search sites can reduce it in the ad networks. The word take in the text or the title raises CTR by 0.9%. Words such as choose/select and visit/call on are quite effective (+0.5% CTR). Words containing real- (such as real or reality) can raise CTR by 0.7%. Derivative words like first-class or the prefix extra- provide a CTR increase of 0.3%. The prefixes mega- or ultra- raise CTR by 0.2%.